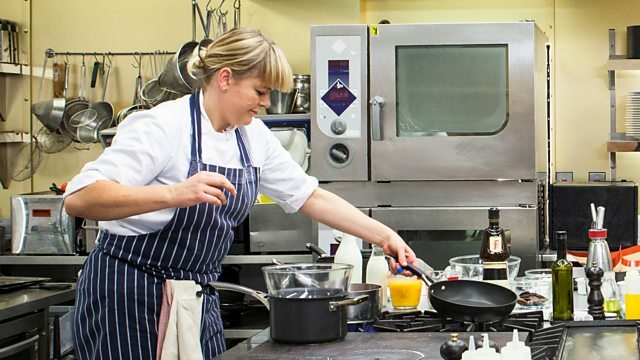 The two remaining central region chefs do battle for a place in the national finals. They must impress the formidable panel of Andi Oliver, Matthew Fort and Oliver Peyton with their four-course menus. With both chefs aiming to treat the heroes of the NHS to the very best, it is a fiercely fought battle. The judges are joined by Dan Smith, a paramedic for the North West Manchester Ambulance Service who was one of the first at the scene of the Manchester Arena bombing. Which chef will go through? With one dish left to impress the veteran judge, the chefs cook their desserts. Marianne is looking to raise a smile with her 'carry on' themed dessert, complete with surprise presentation. Sabrina hopes to make it through with an elevated take on jelly and ice cream while Ryan goes all out with his very sweet treat 'A Spoonful of Sugar'. Which chef will be sent home ? This week three chefs compete in the heat for the central region. 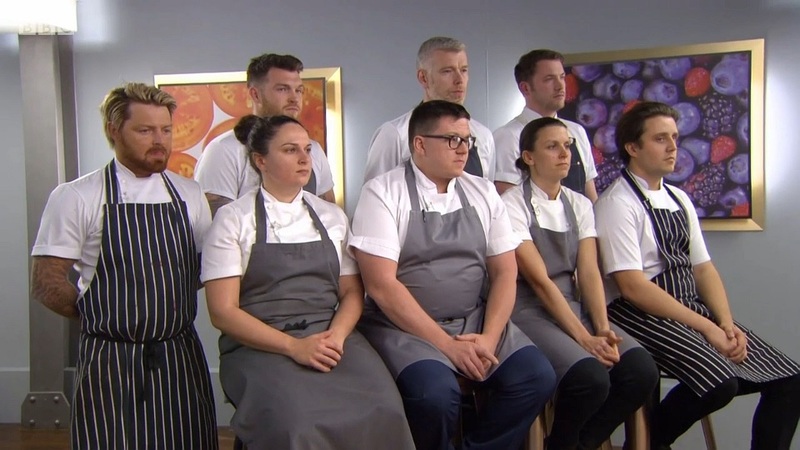 Returner Ryan Simson-Trotman, who failed to reach the national finals last year, is originally from Nuneaton and opened his own restaurant Orwells in the Oxfordshire countryside with his partner Liam, who is also a contestant in the north west region. Newcomer Marianne Lumb has 20 years' experience catering for distinguished clientele who demand perfection. Born in Leicestershire, she worked as a private chef and now runs her own restaurant Marianne, which, seating just 14, is London's smallest fine-dining restaurant. And fellow first timer, Wolverhampton-born Sabrina Gidda, is a two-time Roux Scholarship finalist whose fusion cooking combines flavours from all over the world. After nerves are set on edge when they meet their surprise veteran judge, it is on with their starters. Ryan is hoping his inventive brown sauce ice cream and pork cheek donuts will look like a dessert but impress as a starter. Marianne is taking inspiration from postwar Britain when the NHS was created for her onion and potato starter, Potato Pete and Tracy Truffle, while Sabrina is drawing on influences from around the world to honour the 187,000 NHS workers from overseas, and is hoping to transform a classic soup into a dish worthy of the banquet. Great British Menu continues as the nation's top professional chefs compete for a chance to cook 'A Feast to Say Thank You' at a glorious banquet celebrating 70 years of the NHS, one of Britain's most prized institutions. It is finals week and the competition reaches its thrilling climax. The eight winning regional chefs now battle it out for the honour of a spot on this year's banquet menu, celebrating 140 years of the iconic Wimbledon Championships. 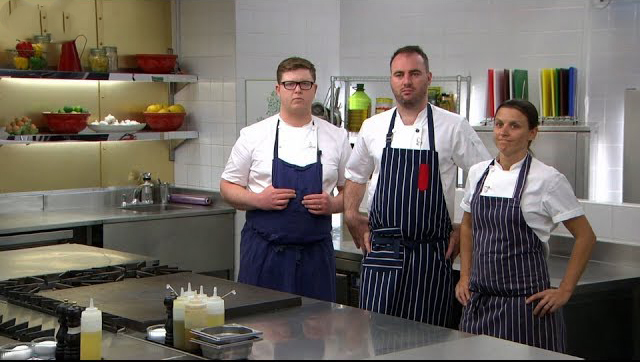 The regional champions now face each other for the first time in the kitchen. Each day, they cook one of their courses for the discerning panel of judges - Matthew Fort, Andi Oliver and Oliver Peyton. They are joined by a host of guest judges who know what it takes to be a Wimbledon champion. The chefs need to convince the judges that their dish is worthy of a place on the final menu and that they have listened to any feedback the judges gave them in the regional heats. At the end of each round, when all the dishes have been cooked, the points are added together and the highest scoring chef wins the honour of cooking that course at the Wimbledon banquet. It is the grand finale of Great British Menu and the winning chefs must now cook their dishes at the incredible Taste of Summer banquet. On arriving at Wimbledon, they are greeted by master of ceremonies Dan Bloxham, who gives them an exclusive behind-the-scenes tour. Once in the kitchen, the chefs face the huge challenge of scaling up their dishes. They must prepare the winning menu for the banquet guests including Wimbledon players and champions as well as those who work behind the scenes to deliver the Championships. From Tim Henman to Judy Murray, the guests are all expecting perfection. Determined to do their absolute best for the celebrations, the chefs are feeling the nerves in the kitchen. Will they be able to deliver? It is dessert day and with just one place remaining at the Wimbledon banquet, each chef is giving everything they have got. With three completely new desserts in contention, whose dish will triumph? The judges are joined by guest judge Annabel Croft, former British number one and Junior Wimbledon champion. It is main course day and with only two spots remaining on the banquet menu, the competition is fierce. As the barbecues are fired up, all eight chefs are feeling the heat. The judges are joined by guest judge Gordon Reid, Paralympic gold medallist and winner of the first ever men's singles wheelchair event at Wimbledon. It is finals week and the competition reaches its thrilling climax. The eight winning regional chefs now battle it out for the honour of a spot on this year's banquet menu, celebrating 140 years of the iconic Wimbledon Championships. 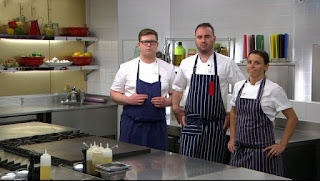 The regional champions now face each other for the first time in the kitchen. Each day, they cook one of their courses for the discerning panel of judges - Matthew Fort, Andi Oliver and Oliver Peyton. They are joined by a host of guest judges who know what it takes to be a Wimbledon champion. Today the chefs cook their fish courses but with some exceptionally high scoring dishes in the regional heats, each chef needs to deliver perfection in order to see off the competition. The judges are joined by guest judge Tim Henman, former British number one, who competed in Wimbledon's semi-final on four separate occasions and now commentates for the BBC. With finals week ahead of them, judge Andi Oliver first summons the chefs to Wimbledon to take a look at where they could be cooking if they win. Back in the kitchen, it is down to the chefs to prepare their starters. With three returning finalists, including former banquet winner Tommy Banks, taking on a host of chefs who have made it this far for the first time, the competition is fierce. The judges are joined by guest judge Sue Barker, host of the BBC's Wimbledon coverage for more than 20 years and a former British number one. Great British Menu continues as the Northern Ireland region chefs compete for the penultimate spot in the national finals, all in the hope of winning a place at the Taste of Summer banquet honouring 140 years of the iconic Wimbledon Championships. The two chefs who have made it through cook their four courses again. They are hoping to impress the formidable panel of judges - Oliver Peyton, Matthew Fort and Andi Oliver, who are joined this week by tennis's greatest entertainer, Mansour Bahrami. It is a rollercoaster of a day but only one can go through to the national finals. Dessert is the last chance for the chefs to secure a place in the regional final. Both Eddie Attwell and Tommy Heaney are attempting technical desserts which feature edible white chocolate tennis balls, while Joery Castel is cooking poffertjes, a traditional Dutch pancake. Only the two highest scorers go through to cook for the judges tomorrow. Eddie Attwell is taking a risk with an unusual meat - water buffalo - which he is serving both as a rib eye steak and also in a quiche. But will the picnic-style dish be up to banquet standards? Joery Castel is looking to triumph by combing mackerel and cucumber in his dish Who Remembers 2nd, while Tommy Heaney hopes his Murray Mound is a fitting tribute to Andy Murray's apparent love of sushi. Eddie Attwell is pushing the boat out, creating five different strawberry elements to accompany the scallops in his dish. Great British Menu continues as the nation's top chefs compete for a chance to show off their culinary skills at the Taste of Summer banquet honouring 140 years of the iconic Wimbledon Championships. There is only one spot left in the national finals and it is the turn of the chefs from Northern Ireland to battle it out. Returning chef Eddie Attwell, who cooks at St Kyrans Country House, Country Cavan, competed in 2016 but failed to make it through to cook the judges on Friday. He is taking on two newcomers - experimental chef Joery Castel, originally from Holland but now working in Belfast, and Tommy Heaney, who has cooked for some of the country's biggest chefs and now cooks at The Great House Hotel in Bridgend. 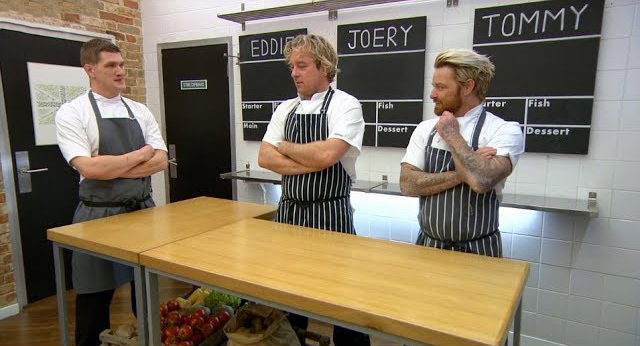 The chefs meet their surprise veteran judge and cook their starters. Eddie is hoping to do better than last year and starts the week with his Wombles Common, using a number of modern techniques - but will his earthy flavours hit the summer brief? Joery is hoping to impress with a tribute to Richard Krajicek, the only Dutchman to win the Wimbledon Men's Singles title, and is combing cheese with sweet elements including carrot meringues. Tommy is creating a warm salad - but will his unusual pigeon presentation be too much for the veteran judge? The two chefs who have made it through cook their four courses again, attempting to impress judges Oliver Peyton, Matthew Fort, Andi Oliver and guest judge Jordanne Whiley, Britain's most successful wheelchair tennis player. Pip Lacey's pineapple dessert, in reference to the pineapple on the top of the Wimbledon men's singles trophy, features a strong second ingredient - coriander. Nick Deverell-Smith is also paying tribute to the pineapple, creating a layered dessert featuring an unusual rice pudding made with couscous.Ryan Simpson is hoping to celebrate summer nostalgia with his dish recalling an ice cream van and featuring a number of complex technical elements. Ryan Simpson hopes to elevate a ploughman's lunch into a gourmet affair, Pip Lacey pays tribute to an unusual Wimbledon icon, while Nick Deverell-Smith looks to celebrate a meat which he thinks is underused - venison. Pip Lacey is combining lobster with strawberry in tribute to the classic Wimbledon strawberries and cream. Ryan Simpson is also using lobster in his recreation of a barbecue and has invented a special technique to create his unique chips. Meanwhile, Nick Deverell-Smith is focusing on crab to make a savoury cream tea. The Central starters feature a humorous take on the unpredictable British weather, a dish representing an allotment and a tribute to Wimbledon's grass. Pip Lacey's starter is a humorous take on the unpredictable British weather and features an unusual presentation. Ryan Simpson's dish represents an allotment complete with soil, while Nick Deverell-Smith's creation is a tribute to the precision cutting of Wimbledon's grass. This year on Great British Menu, the ultimate professional cooking competition, 24 of Britain's top chefs are competing for the chance to cook at a prestigious Taste of Summer banquet celebrating 140 years of the iconic Wimbledon Championships. The chefs have been challenged to create outstanding dishes that capture a 'taste of summer'. They are joined by guest judge Dan Bloxham, Wimbledon's Master of Ceremonies, who is responsible for presenting the trophy to the Wimbledon champions.Both chefs raise their game and impress the judges with their inventive dishes but only one can go through to represent Wales in the national finals. This year on Great British Menu, the ultimate professional cooking competition, 24 of Britain's top chefs are competing for the chance to cook at a prestigious Taste of Summer banquet celebrating 140 years of the iconic Wimbledon Championships. The chefs have been challenged to create outstanding dishes that capture a 'taste of summer'. Their menus must reflect the tastes, smells and colours of everybody's favourite time of year and pay tribute to the incredible history and prestige of the tournament. The three chefs are all producing complex starters with many elements that they need to execute perfectly. 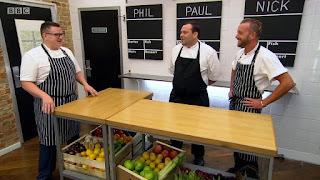 Both Paul and Phil are championing the tomato, creating technically challenging consommes, whilst Nick hopes his rabbit and carrot dish will have the edge over the other two. 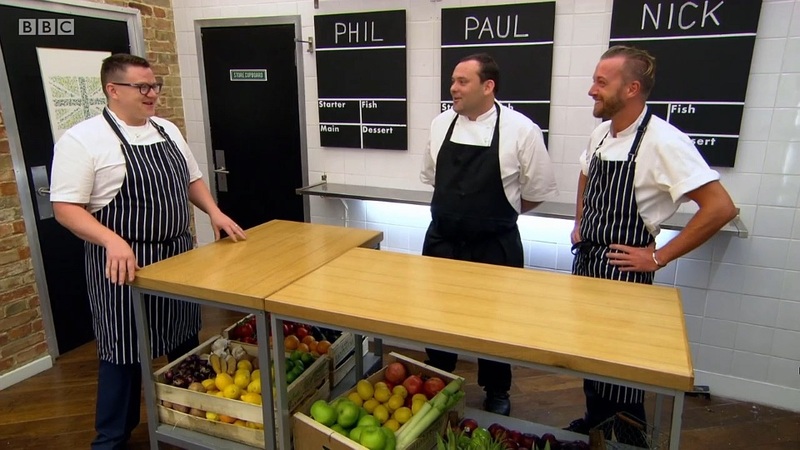 Who will succeed in impressing the veteran and who will crumble under the pressure of the Great British Menu kitchen? Phil is taking a risk with barbecued lamb and in an attempt to elevate a humble barbecue to banquet level, he is serving it with many accompaniments. But will he be able to bring everything this together and cook his lamb to perfection? Paul surprises the veteran chef with a number of unusual ingredients to accompany his lamb. Will Paul be able to pull off these unusual flavour combinations and find himself at the top of the scoreboard?